Capture his sophisticated style with this handsome diamond band, fashioned in 18K yellow gold. This geometric design features a sparkling 1/4 ct. diamond solitaire at the center of the grooved track band. Wear this men's versatile diamond band as an every day ring or wedding band. 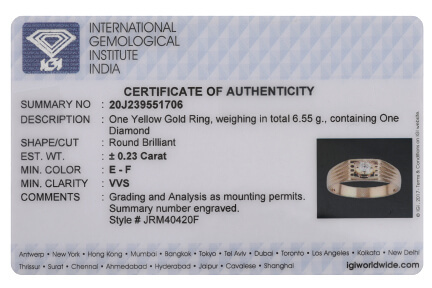 For size customization and other questions, contact info@rajjewels.com or speak to a LiveChat agent.